As a loyal member of VNEA, David has been the Captain of his league for the past 12 years and has led them to several league championships. He is also a founding member of the Charters Player Committee, which was created to assist league coordinators with organization, tournaments, and player issues. David captured 3rd place in singles at the WCVNEA Championships in 2000. A Certified Referee since 1994, David has officiated at many local play-offs and tournaments as well as at the WCVNEA Championships. He has brought his team to compete at the International Championships for many years and has served as captain of those teams for multiple years as well. David enjoys officiating and teaching others the fundamentals of league play. John has been a long-time team captain and promoter of the VNEA and VVS, Inc. in Lincoln, Nebraska. At the VVS City Championships, John has had 7 first place singles finishes and 2 second place finishes and numerous top finishes in the team event. At the Midwest Regional Championships, John has had equally impressive results with many high finishes including 4 team titles. Missing only one VNEA International Championship since 1983, John’s dedication to the VNEA has been stellar. His team has had several high finishes even reaching 3rd place in the Regular Division, and he has been very competitive in singles competition as well. 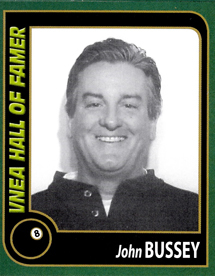 As a player, promoter, and league coordinator, Sandy has been very involved with all aspects of the VNEA. She has also served as Tournament Director for the Oklahoma State Championships. As a VNEA Certified Referee, Sandy said that when she scored higher on her certified referee exam than her husband, that this one memory would last her a lifetime. 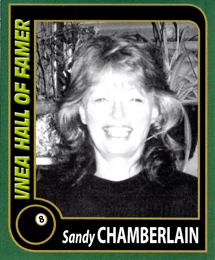 In 1995, Sandy placed 3rd in the Women’s Senior 8-Ball division at the International Championships in Las Vegas. In 1997, she accomplished her goal by winning the Women’s Senior 8-Ball Singles competition. 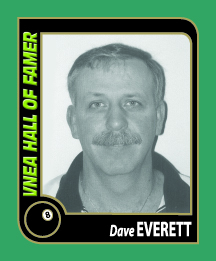 Dave has won numerous league championships and has been on 5 State Champion teams, starting with the OCMA’s very first tournament. In 1999, Dave received the Meritorious Service Award from the OCMA. Dave is also a decorated VNEA Referee and has worked at the Int’l Championships several years. He has served as League President and Captain of his team for over 15 years and has been very active as a League Coordinator. 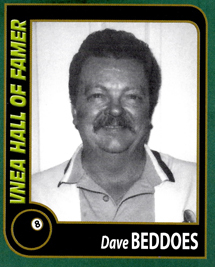 In 1988, Dave’s team placed 4th in the Men’s Regular Division at the VNEA Int’l Championships. Marco serves as the league coordinator for over 200 teams, directs several large yearly tournaments including a benefit tournament for "Children’s Dreams." He is a Certified Referee and Instructor and serves as the Head Referee during the Provincial Championships. Marco has captained his team in over 30 tournaments in his career. He also set a world record by playing 307 hours of non-stop pool in a local fundraiser event. 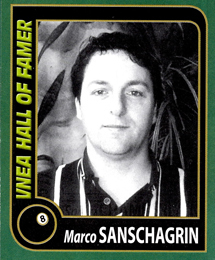 The first year he went to Vegas, his initial trip to the New England VNEA Championships and the Charter Holder Workshops in Bay City, Michigan have left long-lasting memories in Marco’s career.